I made this lovely torte (or is it a tart? or maybe a cheesecake?) for Passover this year. It was a gamble, since we had never made it before, and didn’t have much of a recipe to go on, but it came out wonderful. Many thanks to Jessica of Foodlab for the idea. We’re not sure what a tart shell with a removable bottom is, so we decided to just make it in a springform pan. 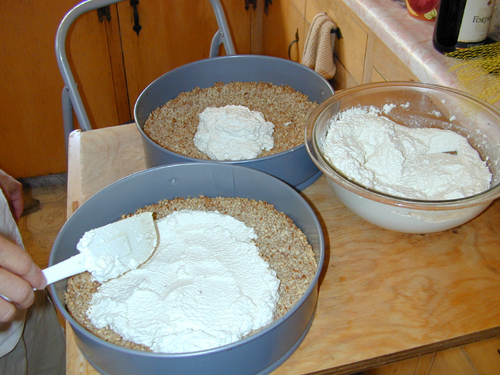 We’ve done nut crusts and nut creams before, so putting them together shouldn’t be too hard. 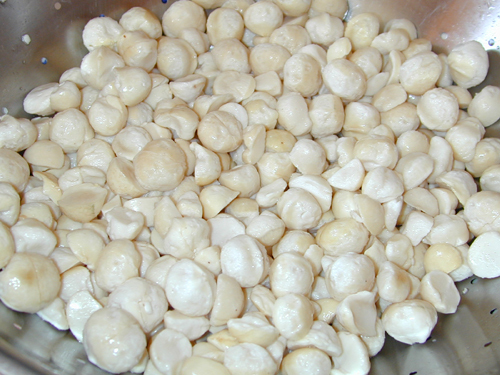 The day before the seder, I soaked the macadamia nuts in water. After about 18 hours, they come out pretty scuzzy looking. But, don’t worry, they clean up good. The day of the seder, we made the crust. 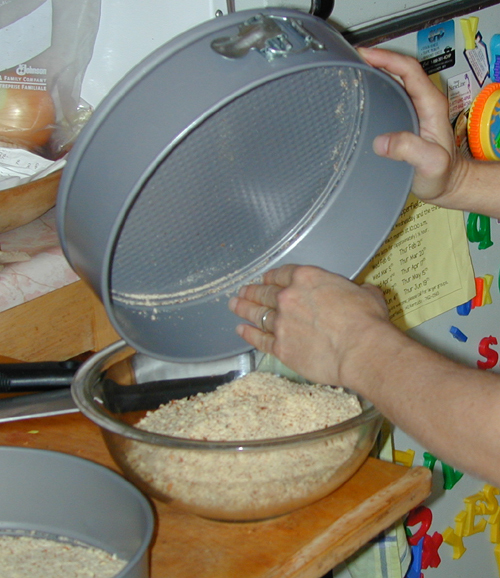 First we ground the almonds into meal. Next, Michael measured the meal in the springform pans (we used two) to gauge the correct amount. 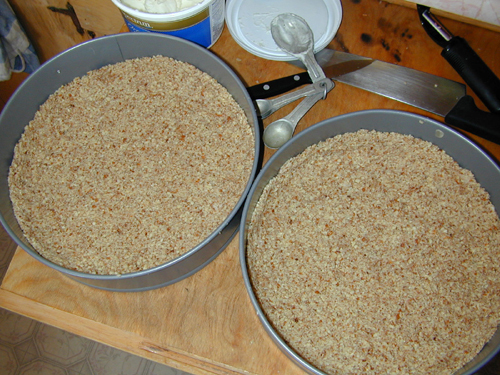 Press finished crust into springform pans, making a lip of about 3/4″ up the sides. We baked the crusts at 350*F for about 10 minutes. If you want a totally raw dish, leave the crusts out for a few hours or pop into a dehydrator, just to help them stick together (and slightly tweak a couple ingredients). 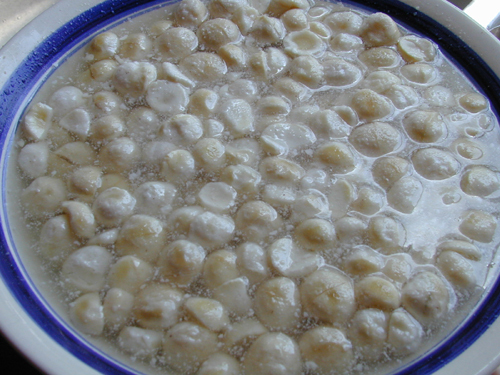 Soak and rinse nuts. 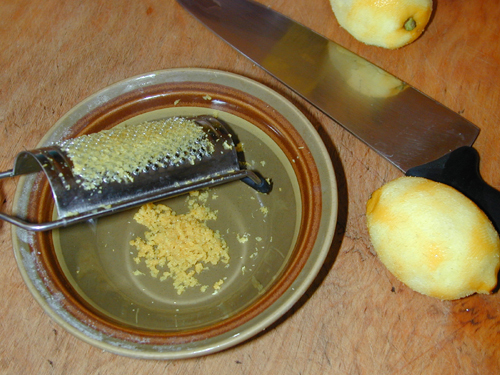 Grate the lemon peel to make zest. Add the rest of the ingredients (except all of the water, which should be added as needed) to the blender and blend until very smooth. It helps to do it in small batches, starting with very little liquid at low speeds. Add enough liquid to get it moving, increase the speed, and add more nuts. It’s hard to get this fully creamy–it had more of a ricotta texture than a cream cheese one–and I suspect we might need a better blender. But do make sure there is no grit, which takes several minutes. Put cream in fridge to solidify. 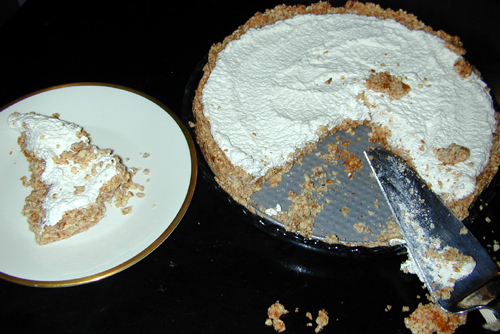 Put the cream into the crusts and pop everything back into the fridge until you’re ready to serve. Remove the springform ring and you’re ready to cut and serve. Best with some berries or other fruit on top. We used blueberries. Some notes: the crust could have been sweeter. Some extra honey would have done that and helped it stay together more. 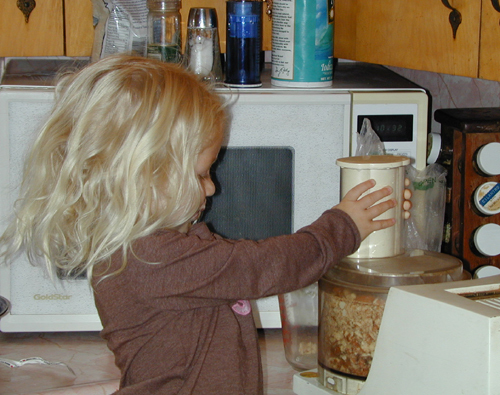 Or you can put dates into the food processor with the nuts. The nut crust was good but a bit chewy. Next time, I’ll leave some nuts as they are in the pictures but process others more finely. We also should have had more fruit, though it was great without any too. Looks great, Cyndi! My crust could have been sweeter as well (I used agave) and I definitely should have soaked and blended the macadamias for longer as I couldn’t get beyond a grainy texture (cashews always come out smooth IME). I topped my tart with kiwi, blueberries, blackberries and raspberries. It was delicious! Thanks, Jessica. The texture I got with the macadamias was the same as the texture of the cashew cream you brought to the LA Foodlab gathering, which was the same as the cashew cream I made for Thanksgiving last year. It’s definitely smooth with no grit. But once in a while (mostly with pine nuts) I get this amazing creamy texture that is like heaven. I want to get it every time, but I don’t know how. A footnote for lowcarbers: The honey in the crust and filling makes this recipe a bit too high in carbs. But I’ve made nut creams before with just stevia for sweetener and they’re fine. And the crust can have stevia or xylitol instead of honey or dates. If you find it needs something sticky, try food processing prunes. They’re low in carbs (if you go easy on them) and stick like dates.